Winmate's LDS serie 1U Rackmount Console which is on sale since many years very successfully, gets a new upgrade feature with 1, 8 or 16 Port KVM switch and IP control option. 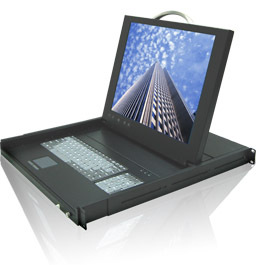 Our other Options are Protective glass, Sunlight Readable, High Brightness option, full 88-key keyboard, and touchpad, all in a 1U rackmountable housing. This console is designed to control servers. With the KVM switch, PS/2 or USB console connectors, you can connect to all the Servers or PC’s you have to control and manage. The newest KVM over IP design provides the cleanest Server Rack Control, including the IP KVM where you can access your Servers anywhere, anytime around the world. The LDS series offer the latest, most efficient and competitive Solution to organize and streamline your server rooms with multiple computers. Why Winmate LDS series 1U 15’, 17’ and 19” Rackmount Consoles Solutions?